This arrangement works very well due to the following: (a) it is transposed to G-major, a friendlier key for the cello, (b) the 6th part assumes the role of the double bass by tuning the C string a fourth lower and (c) the two middle parts use mutes to achieve a sound resembling the quality and volume of the original violas da gamba. Additionally I recommend the following guidelines for this arrangement. 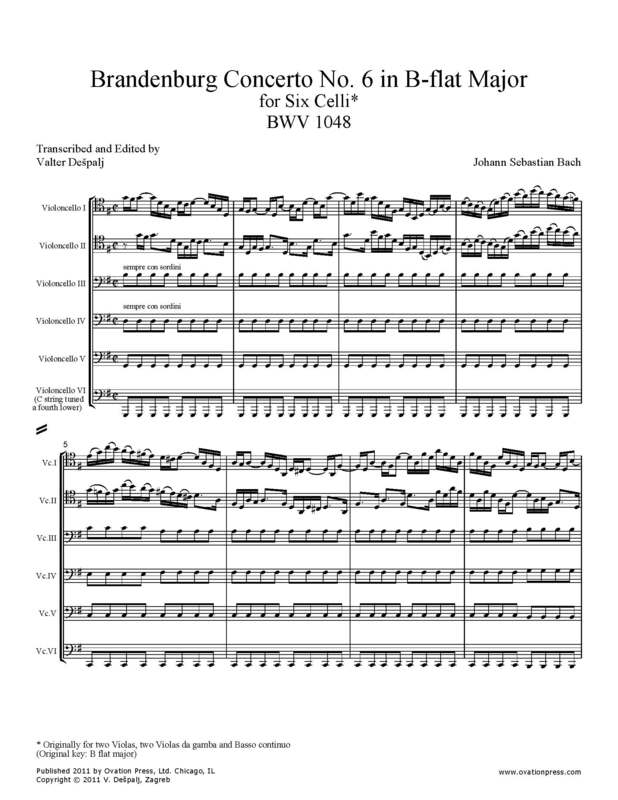 The minimum number of players is six but a good balance could also be achieved in a cello octet by doubling the two middle con sordini parts. I should emphasize that the two upper parts require truly capable cellists because, in essence, this is a double concerto where the soloists are in charge of both the tutti and solo sections. The ostinatos in the other parts should be played lightly, so as not to interfere with the polyphonic texture. The bass in the slow movement should also be light, rather than sustained. Click below to watch videos of Valter Dešpalj's students performing his arrangement of Bach's Brandenburg Concerto No. 6.